Minister of Disaster Management and Human Rights, Mahinda Samarasinghe, met with Navanetham Pillay, the United Nations High Commissioner for Human Rights, at the Palais Wilson in Geneva on Tuesday (09). The Minister, who was accompanied by Attorney General Mohan Peiris, PC, and Sri Lanka's Permanent Representative to the UN at Geneva, Ambassador Kshenuka Senewiratne, briefed High Commissioner Pillay, on the progress achieved in developing a National Action Plan for the Promotion and Protection of Human Rights (NAP) in Sri Lanka. Noting that the NAP was the outcome of a pledge made in 2008 at the Universal Periodic Review (UPR) of Sri Lanka at the Human Rights Council, he outlined the process to date and also the next steps contemplated towards finalization of the first draft Action Plan. The Minister stated that the Action Plan would be subject to further scrutiny and review having consulted political parties and civil society in depth. The aim is to evolve a consensus document which enjoys broad-based support across political boundaries, he added. The finalized draft would then be presented to Cabinet for its consideration and adoption. The Action Plan is designed to achieve an enhancement in the promotion of human rights in Sri Lanka. High Commissioner Pillay welcomed this initiative on the part of the Government of Sri Lanka and also stressed the importance of improving the country's human rights situation, in the post-conflict and post-electoral context. The Minister briefed the High Commissioner on the emphatic electoral victory achieved by President Mahinda Rajapakse and also on the current progress in resettlement in relation to the internally displaced Sri Lankans – the bulk of whom have been returned to their places of origin. The persons who remain in welfare villages under the care of the Government numbering approximately 75,000 have full freedom of movement and several thousands have availed themselves of the opportunity of leaving the welfare villages. They will return to take advantage of the Government administered resettlement process, he said. High Commissioner Pillay also welcomed these developments and expressed the opinion that reconciliation initiatives should be embarked upon as soon as possible. She also highlighted the need to address the issue of dealing with the approximately 11,000 ex-combatants. Attorney-General Mohan Peiris, explained the Government's approach in dealing with these persons which, he said, was predicated on restorative rather than retributive justice. He also stressed that due to the ongoing profiling exercise, those persons with a lesser degree of involvement in terrorist activity would be released in the near future. He also pointed out that a substantial number of persons had already been released from detention. Issues of access for international agencies and legal representation for these persons were also discussed. The Attorney General stated that legal representation for these persons in particular would be assured. The Sri Lankan Government's concern was also conveyed on the communication procedure adopted by the Special Rapporteur on Extrajudicial, Summary and Arbitrary Executions, Philip Alston on 7 January this year by making the "Technical Note" on the examination of the so-called Channel 4 video by the three independent experts, available through a public statement. It was pointed out that, in releasing the technical reports commissioned by him on the Channel 4 video to the media, the Rapporteur appeared to have transgressed the principles and practices governing the methods of work of the UN Human Rights Special Procedures and Mechanisms which find expression in the Code of Conduct and the Manual which governs the exercise of the respective thematic and other mandates. The overarching principle relating to the discharge of the remit of the special procedures is that the member state concerned should be given adequate time for the benefit of responding to such reports and that the final communication, if warranted, would be objective and balanced as it would reflect such a response. Philip Alston, in giving the Government of Sri Lanka, barely 48 hours to receive the report, communicate the same to Colombo and elicit a response thereon, seemingly had ignored these principles. 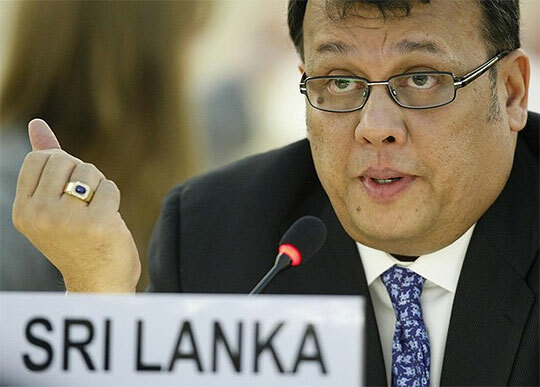 Minister Samarasinghe and the Sri Lankan delegation also conducted two briefing sessions for Permanent Representatives of countries accredited to the UN in Geneva. Ambassadors from Algeria, Bangladesh, Bosnia and Herzegovina, Canada, Chile, Cuba, Egypt, Gabon, Germany, India, Ireland, Kyrgyzstan, Mexico, Nicaragua, Pakistan, Palestine, Republic of Korea, Russia, Saudi Arabia and Uruguay were among those who attended the briefings. A wide range of issues were discussed including those discussed with High Commissioner, Pillay. The extension of the Generalised System of Preferences Plus (GSP+) by the European Union, the arrest of and investigation into the conduct of Gen. Sarath Fonseka, the continuation in force of the Emergency Regulations, the future of the national reconciliation initiative of President Rajapakse and demining, resettlement and the restoration of normality in the conflict affected areas as well as socio-economic reintegration of ex-combatants were discussed.